When you set up DirectQuery or live connection against a data source, the Power BI service will make live queries against the data source when users interact with report visuals. In addition, the service also keeps a cache for dashboard visuals created against the data source. This enables extremely quick loading of dashboards. Periodically, this cache is updated in a process called scheduled cache refresh. With this feature, we’re giving dataset owners full control over how often this scheduled cache refresh happens. Want the most up-to-date dashboard visuals? Have the cache update every 15 minutes. Want to lower the load on your underlying data source? Lower the cache update cadence to once every two hours. With this update, we are setting the scheduled cache refresh cadence of all existing DirectQuery and live connection datasets to be one hour. When this feature rolls out in your region, we will send you an in-product notification if you are the owner of any such datasets. Read on for a walkthrough of how to change the scheduled cache refresh cadence of your DirectQuery/live connection datasets. This walkthrough assumes that you’ve already set up a dataset with DirectQuery or live connection in the Power BI Service. As mentioned above, once you do so, Power BI will automatically make queries against your data source every hour so that your dashboards load quickly. 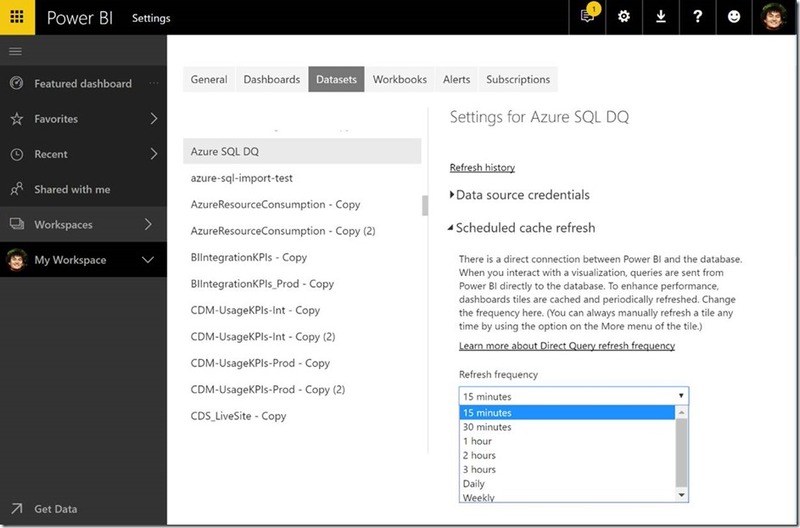 To change the scheduled cache refresh schedule for your dataset, navigate to dataset settings. In settings, go to the dataset tab, and then navigate to the dataset whose scheduled cache refresh cadence you’d like to change. Below, we’ve selected a dataset that which connets to Azure SQL via DirectQuery. Next, expand the section titled Scheduled cache refresh. This is the section added by this feature. It will be available on all DirectQuery/live connection datasets, regardless of the data source. You can use the dropdown to adjust the cadence. You may configure scheduled cache refresh to occur as often as once every 15 minutes, or as rarely as once a week. Once you are satisfied with your selection, select the Apply button to confirm the new cadence. And that’s it! Later, you can check the Refresh history button in dataset settings to confirm that your scheduled cache refreshes with the new cadence. As always, we appreciate your feedback on new features. If you have any comments, questions or concerns, please feel free to leave a comment below, or in the Power BI forums. Also, for further reading about DirectQuery, live connections and data refresh, head to our documentation.